This white burlap has a soft natural color which makes it an ideal choice for a variety of applications. Colorful pieces of felt can be sewn or glued to this burlap to create banners and displays. This durable 100% jute burlap can be used for crafts, school projects and tote bags. In the home or office, this white burlap is a good choice for acoustical panels and soundproofing. Almost any color can be coordinated with this white burlap, including bright shades of red, blue, yellow and green. Black, brown and neutral beiges and tans can also be paired with this white burlap. All of the craft stores are out of this product. By buying fabric by the yard from this site, quality, convenience, and price are far better than what the craft stores offer. I choose this burlap to cover the bottom of my Sun room furniture before I,put the padding and my cushions!It will,cover the springs and make my furniture look better! As Snow Camo for k98 German Rifle. I am wanting to make frayed dinner placemats, and was looking for a good price. For a spring wreath project. Decorating. Using it for under the deck to brighten up the space. To make curtains and pillows. I'm in the process of sound treating my home audio studio. Burlap material will be used to cover acoustical treatment frames. This will make a beautiful aisle runner for our daughter's wedding! I am making long curtains in bedroom. I am going to use natural brown burlap stripes on the outside of the white burlap. To cover speakers so that they blend with the wallcovering. I chose burlap to make pretty acoustic panels. I am purchasing more of this burlap. I made 4 panel curtains and plan to make 3 more. Works great lined or unlined for curtains. I'm hoping to use this for kitchen curtains. Needed a product for a wedding favor that was white not the normal burlap color. I need a good camouflaging material under the lace and this is perfect. Enough body and blackout for what I need. I am using on buffet food table for wedding reception in a barn. I am using it for a white tablescape for Diner en Blanc, an all-white decor pop up picnic. Want to make rustic looking cafe' curtains for my kitchen/breakfast room. Getting ready to repaint and want a simple farmhouse look. how to I measure for curtains? BEST ANSWER: The amount of fabric needed would depend on the type of curtains you are making and the size of your windows. Perhaps our drapery yardage calculator will be helpful for you! Is the burlap fabric pure white or more or a beigey white? I want to use it at a wedding. BEST ANSWER: It is not pure white. They explained that it can't take the pure white dye so this is as close as they can get. It really is pretty close to what you see on the website picture. We needed to match white burlap in a wall decoration. When you look at the burlap alone, it doesn't seem as white, until you hold it up to the decoration then it is just right. If you're looking for pure white you will be disappointed unless you can find a way to dye it yourself that will absorb enough. We're very happy; what we saw is what we got. I would describe it more was a soft white. It's definitely not pure white. It's a "natural" white. Very slightly beige, not a true, crisp, white. It's definitely not a pure white. It has an ivory tint to it. It is definitely a beige cream tone. how sheer is the white burlap? BEST ANSWER: It's burlap. Burlap is not sheer. It has a loose weave typical of burlap and anything underneath will show through if it's a different color. Its just like regular burlap so it's not really sheer just holey, it's not a solid fabric so itll show light thru it. You can see through it with light behind it. I made curtain panels with it. I love them but I use shades behind them. Can I use this for a sun shade? BEST ANSWER: It won't hold up to the outdoors in the long term as it will degrade in weather. I presently have shades made from white burlap fabric that I got from Michaels. They are turning yellow / off color where exposed to the sun. Would your product stay white - is there a way to remove the discoloration? I ordered this product for my wedding I wanted burlap but not the regular colored burlap I needed something softer looking and I went with the white. It's not a harsh white at all intact it's more of an off white antique looking color. 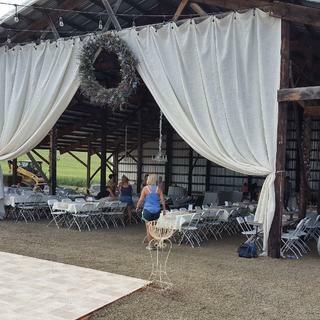 It's perfect for that elegant barn wedding. I am very happy with the color and product. Very nice, needed to cut out for squares on top of apple butter jars for wedding favors. Does take a long time. I used this fabric to make a curtain for a barn wedding. It turned out fabulous! It took 65 yards!!! It is the perfect weight for a curtain. I used a serger to sew the edges together so they wouldn't fray. I also lined the top 6 inches so the curtain would hold firm at the top. I sewed the curtain in the house and I would NOT recommend that for anyone else. It sheds a lot and it gets everywhere, including the heating/AC filters. Excited to find colors of burlap at your website. Ordered for a decorating project. The white is exactly what we needed.